Warning! The recipe for Spaghetti Squash Gratin contains dairy ingredients. This one is going to be hard to resist. So if you are strictly dairy-free you might want to stop reading now. Okay, if you are still reading I will assume you eat dairy products from time to time. Perhaps we can agree on the term “primal” which is typically used to describe a paleo diet or recipe that does include some dairy products. 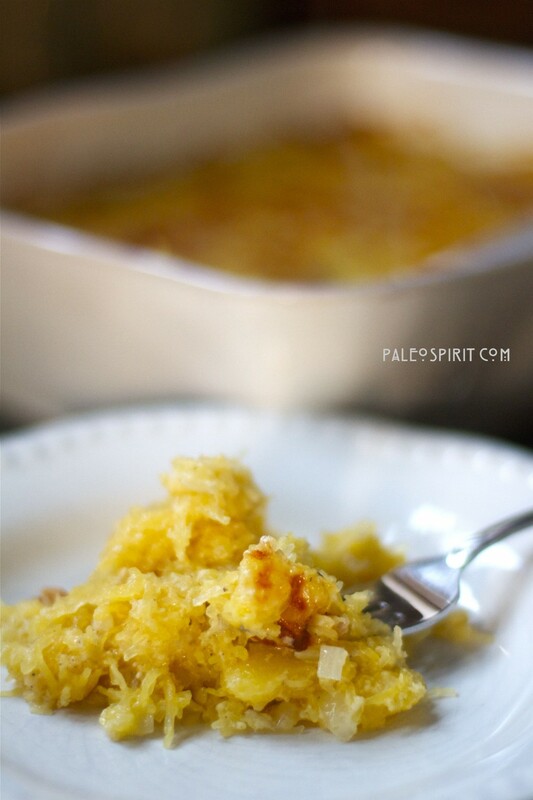 So let’s agree the following recipe is a Primal Spaghetti Squash Gratin. The dairy in this spaghetti squash gratin is not just any old dairy, it’s one of the most wonderful cheeses known to mankind. I’m talking about Gruyère cheese. If you have never tried Gruyère you are really missing out. Gruyère is a type of Swiss cheese. This is the same cheese found atop high quality French onion soup. 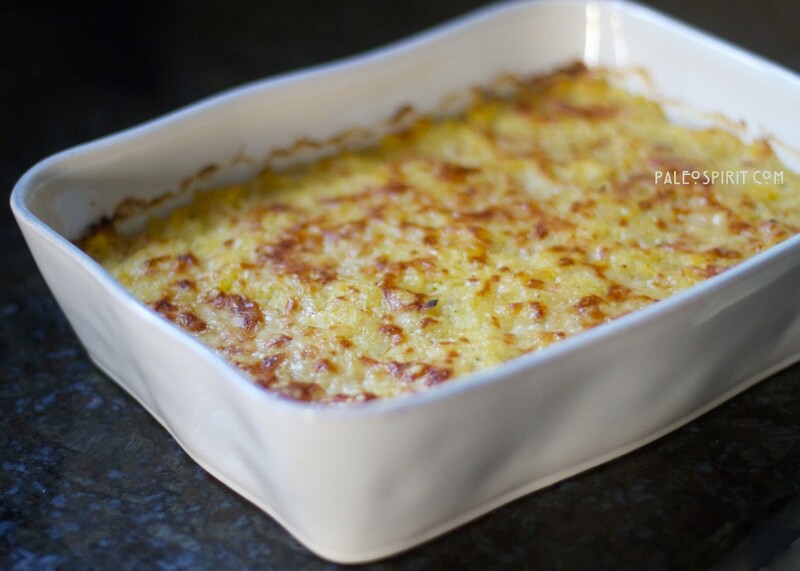 When added to a gratin it imparts a simply amazing flavor. And, in my experience, it is worth splurging on the original version made in Switzerland as opposed to domestic U.S. varieties. The flavor of the original Gruyère is unsurpassed and you need less of it to get the characteristic creamy, nutty, earthy and complex flavor in a recipe. This dish is great on chilly autumn and winter days. The spaghetti squash still has a slight crunch and the nutmeg accents the Gruyère perfectly. It would be delicious with steak and a salad or really any meal that you may, in the past, have served with (God forbid) Macaroni & Cheese. 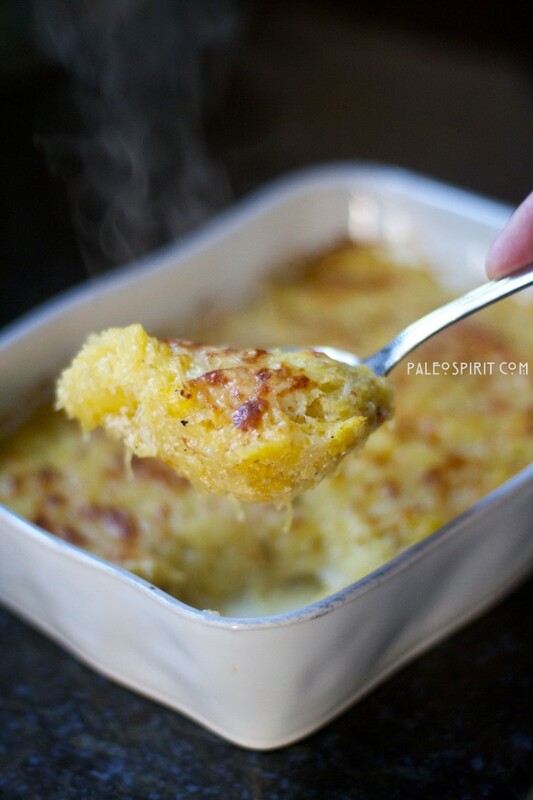 Gratin, made with Spaghetti Squash. Perfect as a side dish. Cut it in half lengthwise and place rind side up on a baking sheet. (If you have trouble cutting the squash you might consider microwaving for a couple of minutes just to soften a bit before baking.) Pour enough water in the pan to come up about 1/4”. Bake for 45 minutes and allow to cool. Use a fork to “shred” the flesh of the spaghetti squash -set aside. Add the finely diced onions to the pan and sauté until translucent (approximately 12 minutes). Stir in the salt, pepper and nutmeg. Add the Greek yogurt, spaghetti squash and 3/4 cup of the Gruyère to the pan, stirring to combine, and heat for a couple of minutes on medium. Pour the mixture into a baking dish and spread it evenly. Top with the remaining 1/2 cup of grated cheese and bake for 30 minutes until hot and bubbling. If the top is not browned you can broil on high for a few minutes until the Gruyère cheese is nicely toasted. 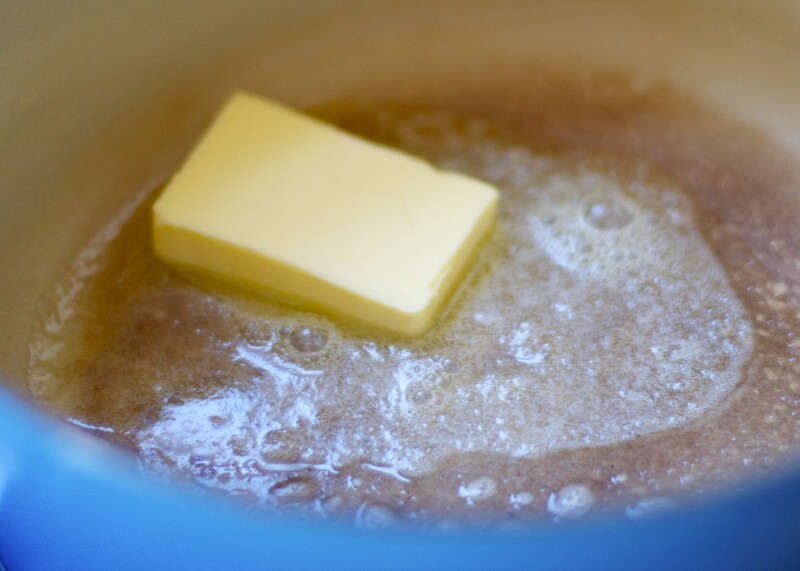 Heat butter in a medium/large pan. Mmmm butter…. What do you think? 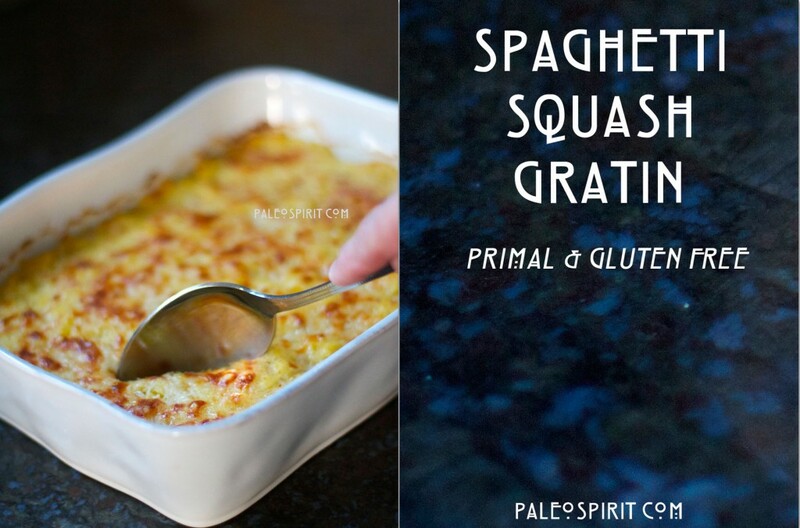 Will you try this primal spaghetti squash gratin? Find other paleo and primal side dish recipes here. 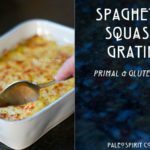 39 Responses to "Spaghetti Squash Gratin (Primal & Gluten-free)"
I can tolerate a little dairy so I think I will try this! I like your Mac and Cheese (God forbid) comment. Made me chuckle. Before I went paleo, though I ate pretty well, I did indulge once on a while on a (gasp) frozen side dish of Trader Joes Frozen Mac and Cheese and it had gruyere cheese in it. It was to die for! I am hoping this will taste a little like it….and I love spaghetti squash. Thanks for the recipe. Have a great day. Off to do my at home WOD since my DS is home with a cold…poor kid. I’m very familiar with Trader Joe’s frozen Mac & Cheese. Before paleo we didn’t eat a ton of pasta but we definitely had that dish from time to time. I’m not sure what I would think if I were to try it again. I’m honestly not tempted by starchy pastas and breads anymore. This dish should be reminiscent of it but obviously will be very different. I hope you like it. And I hope your little one feels better soon! made this tonight! AMAZING! It is going on the Christmas menu. It is kind of a Christmas-worthy recipe. I agree. I will probably do the same. I have one spaghetti squash left over from my summer garden – it’s going in this recipe tomorrow! Can’t wait to try it out! I am as Paleo as a girl can get, but seriously, this is it. 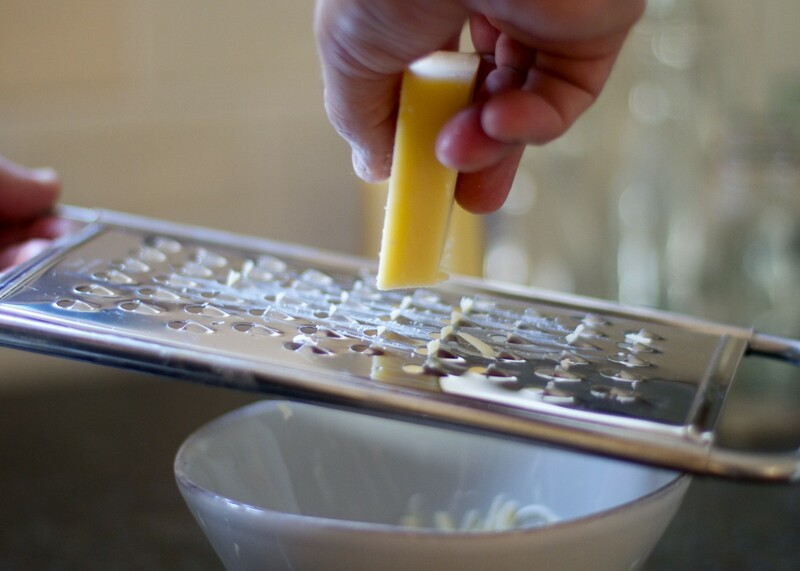 I am going to try this one, cheese and diary pro or contra. This is such a great and simple recipe and idea, I am sure it will taste amazing. Cannot wait to try it, thank you for this great recipe! 1. Can I use plain whole milk yogurt instead of plain Greek yogurt? 2. Can I skip the microwave step and just cook the spaghetti squash a little longer in the oven? I think that would work fine. The microwaving is really only to make it easier to cut open but it’s not critical. I hope you enjoy the recipe. Thanks a lot, Lea. The recipe looks delicious! What a fabulous recipe idea! I absolutely adore it. 🙂 I’m so used to imagining only two ways to eat spaghetti squash (slathered in butter with salt & pepper, or topped with marinara sauce) that this simple and delightful way to prepare would never have occurred to me. You’re welcome Kristen. And thank you for the compliments and for linking to the recipe! I literally went to the grocery store today to buy more spaghetti squash and Gruyere just to make this again. We’ve been eating spaghetti squash with a simple cream and parm alfredo sauce with chicken and bacon… but this sounds like a fabulous version for eating with Christmas dinner! I cant wait to try it! Well, Karen, I certainly can’t argue with the idea of adding bacon to a spaghetti squash recipe. That sounds good too. I hope you like this version. Great, Laurie. I wish I had a root cellar! I hope you like the recipe. This was fantastic! I used 3 tablespoons of butter, just because I love it and added sautéed garlic, about 4 gloves chopped. I LOVE garlic; their isn’t much I don’t add garlic to! I will definitely be making it again! Mine turned about wonderful all three times I have made it! I wanted to let you know about my ‘happy accident’ that I stumbled upon. When I picked up yogurt, I thought it was plain until I checked the container, after dropping it in, and realized it was honey-flavored. I start to freak out then thought, a little sweetness couldn’t hurt, and I have to say I love it even better this way! 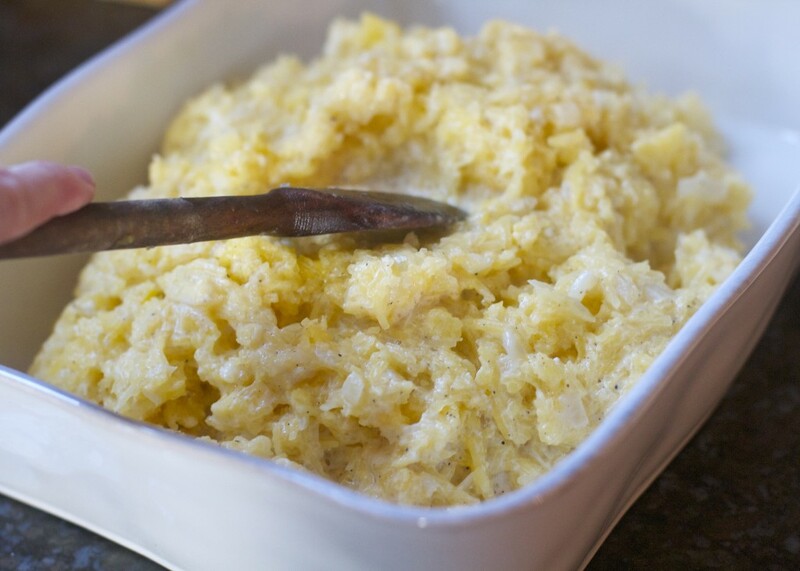 Thanks for a delicious recipe for even non-spaghetti squash lovers! Lea, thank you for this wonderful recipe. Gruyere is on my shopping list for Friday and I can’t wait to try this! I will write after we give it a try. I did want to mention the most underutilized part of almost any squash….the seeds! 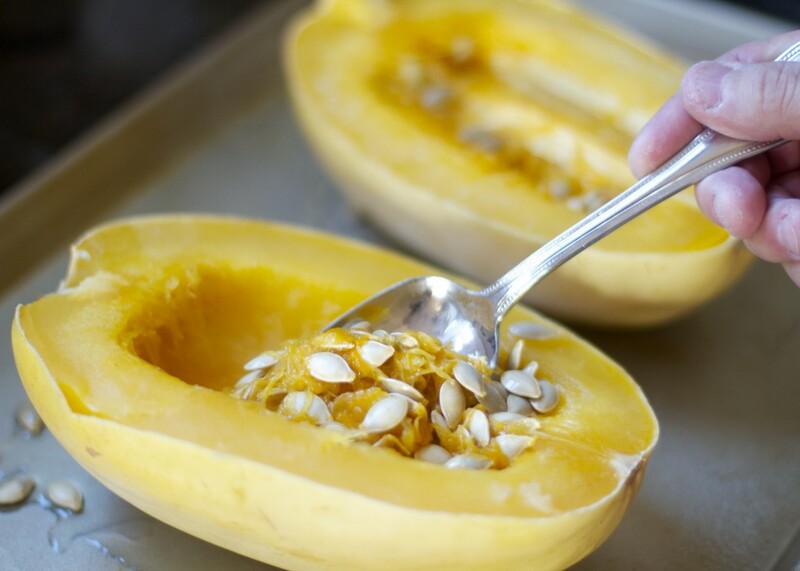 I cut my squashes in half and scoop out the insides, clean off the seeds and add sea salt or spices to them. I then roast them on a piece of tinfoil alongside the squash for about 20 minutes, stirring every 5 minutes to keep them from sticking. Fabulous, yummy, nutritious little snack! This dish is absolutely delicious! We make this at least once a week and when we have dinner guests over. I agree that I do not miss pasta/starches at all since going Paleo but this recipe has really curbed any urge. It is nice to have a side dish that doesn’t feel so vegetable-y. Thank you so much for sharing!! I have made this twice and love love love it!!!! I am on the wheat belly diet so I can have cheese so this was not a problem for me. I made it once for a group of people and had no leftovers and people were talking about it all night. Will definitely make again! THanks for the feedback Amanda. It’s one of my favorites as well. I was wondering how this freezes. Just me eating it and I don’t eat much at one time. Looks great as I love spaghetti squash! I’ve never frozen it so I can’t make any guarantees. But I don’t see why it wouldn’t be just fine frozen and then eaten at a later time. Good luck. According to the time magazine “Nature”, the Paleo people ate cheese 😉 And certain places drank cow / goat etc milk as well, when there was times with low food conditions… That should especially count for the more northern people in cold climates, as they still today, seem to cope with milk better than many others. I have never eaten spaghetti squash but this is just the right type of recipe to get me trying it. This weekend for sure!! I have been discovering lots of new veggies too. This one is mighty good. I hope you enjoy it. MJ, goat cheese in this recipe sounds divine. Don’t you just love finding new and delicious ways to eat these healthy veggies?! 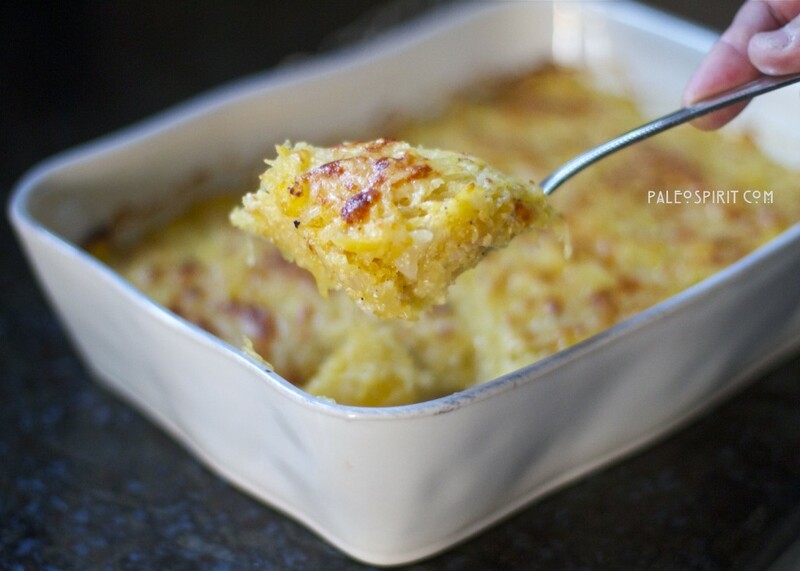 I agree this is a healthier version of Mac & Cheese! Hope your family likes it. I made this last week and it was delicious! Do you have any tips on minimizing the liquid once it bakes? When you serve a piece there is generally some liquid in the bottom of the dish. Any suggestions would be great! Once again, the recipe is AMAZING! If you have too much liquid in the finished dish then you might want to consider wringing more liquid out of the cooked spaghetti squash. You can try using a clean dish towel for this and just wrap it inside and wring out some of the liquid. I think that will help the final product be drier for you. Made this on Easter, absolutely delicious and an impressive dish!!! It is now one of my favorite family gathering recipes! Making it again this weekend. I’ve just found your blog today and I’m feasting on so many of your beautiful dishes w/my eyes! I’m pnning many and can’t wait to try a few that are really appealing to me, however, I’m new to a Paleo Lifestyle and closing in on Day 27 of my 30 Day Challenge and I’m a bit perplexed. I was of the understanding that Paleo doesn’t include Dairy (Cheese & Yogurt etc) or do I have it wrong? Maybe I just need to omit Dairy during the 30DC and while trying to lose weight. Hi! Nice to meet you. You are right that “paleo” is generally dairy-free. And it is part of the protocol to go on at least a 30 day elimination diet where you do not eat dairy. However, some people then reintroduce some full fat, pastured dairy into their diets (some people find they can tolerate goat dairy but not cow dairy) and some people find they can tolerate it with no issues and eat smaller amounts of high quality dairy. So this recipe is for those folks. I have found that even though I thought I could tolerate dairy I know now that I cannot due to an issue with my esophagus (EoE). Some of my recipes contains dairy for people that are able to eat it but most are dairy free and/or have dairy-free options.